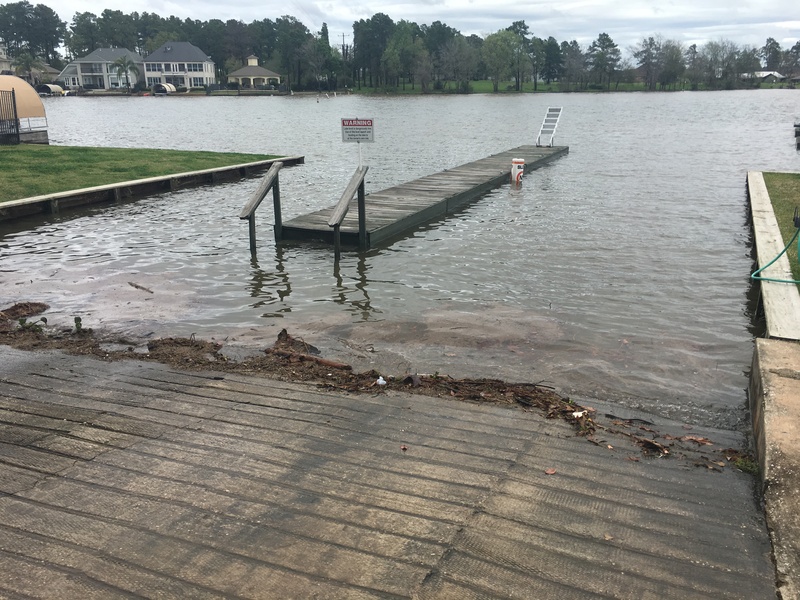 Conroe, Texas – March 11th, 2016: Effective immediately, the San Jacinto River Authority is temporarily closing Lake Conroe to motorized boat traffic due to the presence of submerged objects, floating debris, and other hazards that could put the safety of boaters at risk. The lake will remain open for swimmers, kayaks, canoes, and other non-motorized vessels. We fully recognize that this is the beginning of spring break, and we will make every effort to fully reopen the reservoir as soon as conditions allow. The lake level has risen to 203.08’ above mean sea level, which is two feet over the lake’s normal pool level. The last time the lake reached this level was in November of 2002. At this level, many docks, bulkheads, small islands, and other structures are fully submerged and create a very dangerous situation for boaters. In addition, high winds and rapidly-flowing water from local streams have resulted in a large amount of floating debris on the reservoir. Also, with bulkheads becoming submerged, lake area residents should be cautious of electrical outlets and equipment coming into contact with water. Over the past two days, the Lake Conroe watershed has experienced rainfall totals from four to seven inches. This has resulted in a rapid rise in lake level. As of 7:00 AM today (March 11), it appears that the level has crested, but local streams continue to drain out at a significant rate. See Figure 1 below showing the lake level over the past week. SJRA is currently releasing water from the dam in accordance with its operating procedures for the reservoir. The rate of release is currently 7,640 cubic feet per second, which is slightly less than the peak rates experienced in the two large rainfall events in May of 2015. For anyone interested in monitoring the current conditions of the reservoir, SJRA provides continuous data regarding lake level and release rate on its homepage along with numerous other data points. In addition, live gauge data can be accessed by clicking the link labeled “Additional Data” (look for the map labeled San Jacinto Contrail Web). There are excellent resources on the Additional Data page that provide up-to-date information on rainfall, stream flows, lake level, and other important weather information For more detailed information and updates on lake levels and release information please go to www.sjra.net. Conroe is considered “full” at an elevation of 201.00 feet above mean sea level.